“I was representing mankind up there.” Mr. McCandless said of his maiden voyage in February 1984. NEW YORK — Bruce McCandless, the first person to fly untethered in space, whose journey into the dark void above Earth was preserved in an iconic photograph, died Thursday. He was 80. NASA announced his death in a statement Friday but did not provide more details. Equipped with a bulky backpack, two dozen tiny jet thrusters, and two bottles of nitrogen gas to fuel them, Mr. McCandless took his maiden voyage in February 1984. 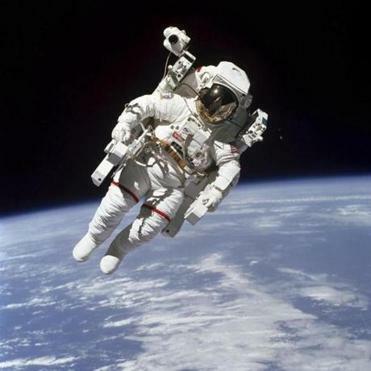 It was captured in an image of a man in a white spacesuit floating against a backdrop of the great black abyss. A front-page article in The New York Times called Mr. McCandless’s ascent “a spectacle of bravery and beauty.” Mr. McCandless and another astronaut, Robert L. Stewart, the article said, had effectively become “the first human satellites,” orbiting the Earth at the same velocity as the nearby shuttle — 17,500 miles per hour. “That may have been one small step for Neil, but it’s a heck of a big leap for me,” Mr. McCandless joked at the time, in reference to comments Neil Armstrong made after taking the first human step on the moon in 1969. One of 19 people selected by NASA to become astronauts in April 1966, Mr. McCandless, a former US Navy captain, would play a role in Armstrong’s famed moonwalk only three years later. Mr. McCandless, in mission control, was the voice the world heard communicating with Armstrong and Buzz Aldrin during their Apollo 11 mission. Mr. McCandless would spend another decade helping to develop the technology — called manned maneuvering units — that would allow him to float free in space at the age of 46. That 1984 mission had various technical objectives, but it was Mr. McCandless’s inaugural spacewalk that captured the hearts and minds of those about 170 miles below. The Times described Mr. McCandless as “a puffy white gingerbread man” floating above the continental United States. “This is neat,” he said, before peering down. During his second space shuttle mission, in 1990, Mr. McCandless helped deploy the Hubble Space Telescope. By the end of his career, he had logged more than 300 hours in space, including four hours in a manned maneuvering unit, according to his NASA biography. Bruce McCandless II was born on June 8, 1937, in Boston, into a family of high-ranking naval officers. He graduated from Woodrow Wilson Senior High School in Long Beach, Calif., and received a bachelor of science degree from the US Naval Academy in 1958. He later earned two master’s degrees — one in electrical engineering from Stanford University and another in business administration from the University of Houston at Clear Lake City. He received several honors throughout his career from the Defense Department, NASA, and the Smithsonian Institution. He was also awarded a patent for his role in designing what NASA said was “a tool tethering system” used during spacewalks. Mr. McCandless leaves his wife, Ellen Shields McCandless, two children, and two grandchildren. While reflecting on that famous photograph in July 2015, Mr. McCandless noted, in an interview with The Guardian, that his visor had been down.